Receiving a dire medical diagnosis is worrisome and can leave the patient and loved ones feeling helpless. The pronouncement can be even more frightening when the condition is uncommon. To navigate the bewilderment there is research on unfamiliar terms and the effect the ailment will have on the patient. Such can be the case with Flail Chest. Flail Chest is a serious condition that happens to people who’ve suffered from blunt trauma (heavy fall, catastrophic car accident, a victim of violence). When three or more ribs are fractured in several different places, the chest wall over the broken ribs can become misaligned with the rest of the chest. 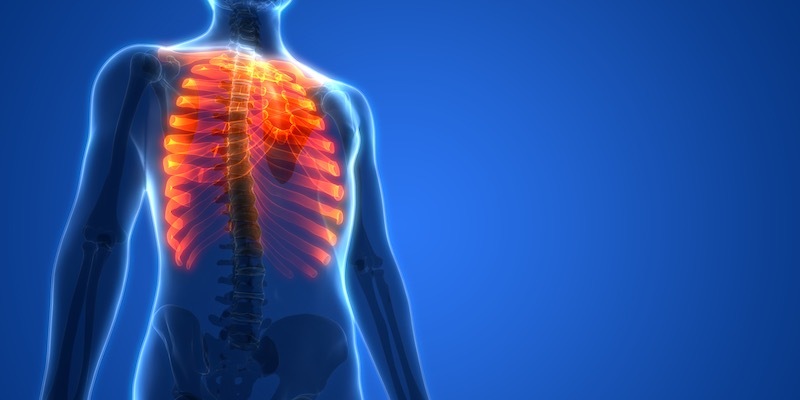 It’s an extremely dangerous condition since it leaves the lungs with less space to expand as the person breathes. It’s a life-threatening condition and it must be treated immediately. As explained above, the most common cause of flail chest is severe trauma. The most likely culprits are motor vehicle accidents. In rare instances, it can be the result of bone disease or a genetic disorder. The most common way of diagnosing flail chest in a patient who’s suffered from trauma is a visual examination of the chest and a close evaluation of the patient’s breathing patterns. If the doctor suspects Flail Chest, he or she will order X-Rays to confirm the diagnosis. Treatment includes oxygen via mask or a ventilator to ensure adequate breathing. The medical provider will usually prescribe pain medications and in severe cases, may recommend surgery. Recovery depends on the patient’s age, the extent of the injuries, and their overall health. Older patients are more likely to suffer from complications, such as pneumonia, deformity, chronic chest pain, or respiratory failure. Flail Chest cannot be prevented since accidents are typically unavoidable. Even wearing a seat belt, you could suffer from Flail Chest after a crash if the impact was great enough. At The Orthopedic Clinic, we want you to live your life in full motion. If you’ve been diagnosed with Flail Chest, let us help you. We’ll tailor a treatment plan that’s best for your lifestyle and get you back to doing the things you love.